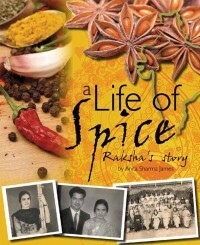 With A Life of Spice – Raksha’s Story, Anita cleverly weaves the tale of her mum’s life journey in between some of their favourite recipes, also providing an introduction to the tenets of Indian cuisine and culture. Beautifully illustrated with pictures of colourful food and with photographs of Anita’s extended family, the book covers life in last days of the British Raj, the partitioning of the country and the Indian diaspora which saw the family relocate to Birmingham. Thanks to the memories of her mum and other family members, Anita – who was a baby when she came to England – is able to paint a vivid picture of life in bustling Delhi and rural Punjab, and of the very different English scenery and lifestyle to which the family had to acclimatise. She also describes the traditions of occasions like Diwali and Indian weddings, plus family legends including how Anita was officially given the wrong name by an uncle sent to register her birth! Although Anita has lived all but the first four months of her life in England, her family always ensured she and her three sisters remained in touch with their Indian heritage, not least when it came to food. Raksha instilled a real love of food in Anita from a very early age, passing on the skills she had learned from her own mother. Anita’s eventual decision to give up her career as a research scientist and set up an Indian cookery school is was born of a desire to share her passion with others – this lovely book continues that theme, and should inspire all readers to get cooking. A proportion of the proceeds of each sale will go to the Motor Neurone Disease Association, since Raksha now suffers from the disease.